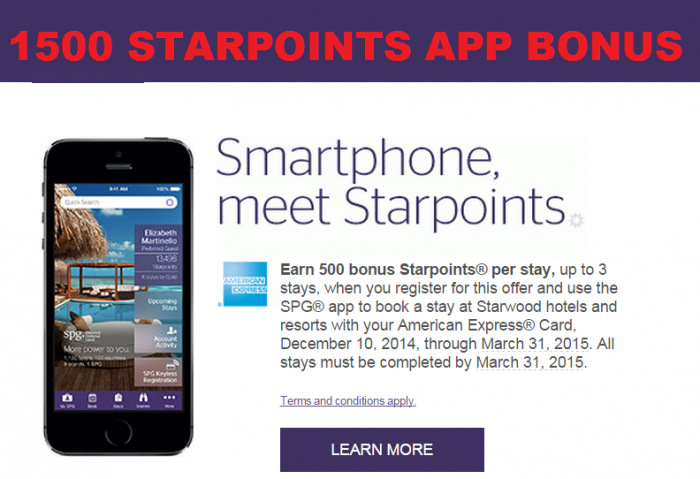 Starwood Preferred Guest (SPG) is offering up to 1,500 bonus Starpoints for reservations that are booked using its smartphone apps and consumed between December 10 and March 31, 2015. You earn 500 bonus points per stay for up to 3 stays during the offer period that are booked using any of the apps and consumed during the offer period. Reservations made prior but consumed during the promo period will qualify for the bonus as well. You must register for this offer to be eligible for the bonus points and registration is available here. The terms and conditions state that you must book and pay using an American Express card, but I doubt that the actual payment card type info from the properties is transferred to Starwood (at least it has not in the past). This is an easy promo for 1,500 extra Starpoints for 3 Starwood stays. Am I the only one that don’t usually book using any of these apps? I only use them if I need to switch or book hotel for the night and don’t want to bother pulling out my laptop. I do, however, use them to check if the reservation is upgraded and/or my point balances. Registration and Earning: Members must register online with a valid SPG account number at spg.com/appamexbonus by March 31, 2015, midnight Eastern Time (ET). Registered members, who have downloaded one of the SPG mobile apps, are eligible to receive 500 bonus Starpoints for up to three booked and completed stays December 10, 2014 and March 31, 2015 (the “promotion period”) that were booked through any SPG mobile app and charges were settled with any American Express®Card. Bookings made prior to the promotion period are eligible, but only eligible stays consumed during the promotion period will receive bonuses. Check-out must occur on or before March 31, 2015 to be eligible for bonus Starpoints. Registered members may earn a maximum of 500 bonus Starpoints per eligible stay, and maximum of 1,500 bonus Starpoints during the promotion period. This bonus is eligible at all properties that participate in the SPG program. Bonusing: You must first register for this offer, download one of the SPG mobile apps and then use the SPG mobile app to book a stay using any American Express®Credit or Charge Card. Eligible Stays: An Eligible Stay is defined as one or more consecutive nights paying an Eligible Rate in the same hotel regardless of the number of check-ins or checkouts that occur and post to the member’s Starwood Preferred Guest® account. Eligible Stays with at least one night in the promotion period will receive a bonus. An Eligible Rate is any rate that is eligible to earn Starpoints in the Starwood Preferred Guest program. A description of SPG-participating hotels and resorts and of Eligible Stays and Eligible Rates can be found at spg.com under Terms & Conditions of the SPG program. See Section 1.4b iii for the complete definition of Eligible Rates.